Isn’t it amazing how pizza has become a staple of the American diet, even in little towns where there are not many other choices? In my case I live too far up in the mountains for them to deliver, and too far for me to get a warm one home. Plus the local “take and bake” is terrible. So either I sit alone at one of the big jovial family sized tables in the local pizza shop, or I resort to taking something home from the frozen food counter. And it is there that I discovered gold just when I said I was not going to try another one, even if they were on sale. Not only did I discover my favorite (by far) flavor of Canadian style bacon and pineapple, I found it with the naturally rising crust – or so they claimed. Expecting to be disappointed once again with food you take home and heat, I was blown away to find I really did get a great pizza with a naturally rising crust. So I hauled the box out the trash to see what I was eating and to share the word. 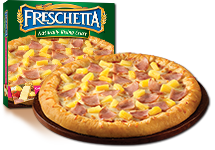 And in this case the word is Freschetta – a great name for a great pizza, even if you do have to heat it up yourself. So much better than those skinny rubber crusts so many chains make. ‹ Why is the Golden Gate Red? And Other Naming Questions.